The design shows great attention to detail, strong construction techniques and fastidious workmanship. 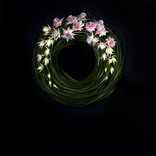 The result is a three dimensional wreath with impact when viewed from all angles. Susan chose materials and features to reflect ‘the turn of the century’ and create a wreath reflecting the times of 1914. The design is based on the Australian Red Ensign Flag featuring the Southern Cross and the Commonwealth star. It was this flag to which members of the public and members of the armed services related to and adopted as Australia’s national flag prior to 1954. Susan added a white cross (from the Field of remembrance at Te Awamutu in New Zealand) to symbolise the involvement of NZ in the ANZAC story. 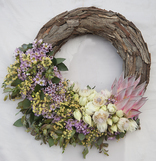 The red-pink of the wreath is achieved by meticulous placement of protea bracts to produce subtle gradations of tone and add to the 3 dimensional effect. The stars are made from white protea bracts, carefully arranged to achieve the correct number of points on each star. The ribbons of red, white and blue were chosen to represent the British Empire. 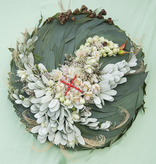 The eye is drawn to the white cross, also constructed of white protea bracts. Buxus leaves were sprayed gold to accent the gold in the banner, and the dates on the cross. Flanking the cross are ‘roses’ constructed from individual Leucadendron bracts. These are accompanied by sprigs of rosemary to follow tradition. Susan's design notes reflect a great deal of detailed research, covering the history of wreaths and the red ensign flag, and the period. Susan wrote a detailed analysis of the various elements of her design. This striking design honours the family history, where ‘the toss of a coin’ decided the fate of two brothers. Diane’s husband had a great uncle, Joseph Reece, who was the brother who lost the toss. Joseph enlisted in September 1914, and made it to Gallipoli, but was killed in action there. The design is based on the penny that was tossed and incorporates pennies and other circular shapes. It also explores the love and sacrifice of Joseph’s mother and all mothers who gave up their children for the sake of our country. A soft colour palette was used. Wool was incorporated to remind us of the women who knitted socks to post to their loved ones. The pink wire circles represent the generations within a family and how we are connect to those who have gone before. Diane used the round shape of the wreath to signify a mother’s embrace of her son as well as the circle of life. She deliberately made it lightweight in construction, using rough twigs, to symbolise the fragility of life. The colours used give a harmonious effect and are evenly spaced. This design pays tribute to the resourcefulness of Australian women in war. Texture is provided by torn paperbark, secured with hessian bias. These colours were also chosen also remind us of uniforms and the Australian outback. 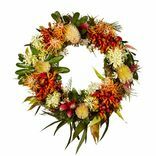 Warm tones of Leucadendron ‘Red Safari’ and red flowering gum encircle the wreath and link to the rising sun. Colour, texture and balance is provided by more Red Safari, Banksia coccinea, cymbidium orchids, Berzelia and waxflower. The Banksias and cymbidiums are the focal and secondary flowers and are arranged in 3 groupings to create a balanced design. 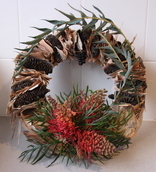 Curved Corymbia ficifolia leaves and sprigs of rosemary are used to gently link these groupings. 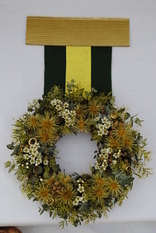 This wreath was inspired by the Royal Australian Army Nursing Corps (RAANC) and designed to be laid at the Nurses Memorial Candlelight Vigil which is held annually in Brisbane’s ANZAC Square. The tones were chosen to reflect the scarlet colour of the RAANC badge. The tatami feature, made of red Eucalyptus pauciflora stems and black copper wire, is placed to divide the wreath in two. Woven through the tatami feature is an aging piece of metal to represent the 100th anniversary of ANZAC. Half the wreath features clean lines achieved by carefully pinning the leaves so they all face the same direction. The other half is more textural with the leaves facing in different directions and overlaid with Grevillea ‘Flamingo’ flowers. The feature flower is Hakea laurina. This innovative and very patriotic design celebrates all ANZACS but specifically Bronwyn’s paternal grandfather who celebrated his 21st birthday 100 years ago during the battle at Lone Pine. 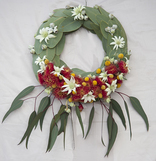 The wreath is constructed of Eucalytpus bark to resemble a slouch hat in outline. Slouch hats traditionally had the left side of the brim turned up and pinned with a rising sun badge. The wreath is composed of 2 concentric rings, the lower thinner ring imitating the brim of the hat and the central and higher ring symbolising the hat band. Turning up the brim creates an asymmetical design. It is constructed of gum foliage and wattle blossom. The rough texture of the bark is a great contrast to the wattle blossom which is itself delicate, yet strong and dominant due to massed effect of the golden yellow colour. This design is inspired by the Australian Army Nursing Service. The colours are chosen to reflect the nurses’ uniform which included a grey skirt, and a bright red shoulder cape. The clustering of red flowers diagonally opposite one another represent the cape with the gum foliage in between reminding the viewer of the skirt. The red flowers are red paper daisies, chosen to signify the cheerful demeanour the nurses displayed while working. 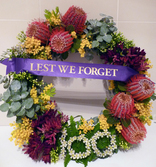 Golden wattle, our floral emblem, was added to represent the Australian heritage of the nurses. 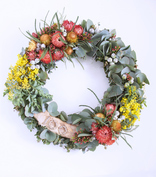 To work in harmony with these flowers, Sarah added Dryandra, bud wax, orange paper daisies and tetragona nuts. She made ‘100’ out of paperbark. 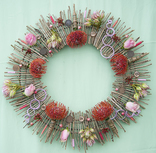 The wreath is well constructed and shows radial and parallel placements of flowers, with one larger grouping and one smaller. The materials used provide interesting and contrasting textures.